More than likely, the minds at Lucasfilm will not be bringing Darth Sidious into this new trilogy. Wouldn’t it be great if they did? After all, who better than the most powerful Sith Lord to stir up trouble for the new Jedi. What better character sums up evil incarnate than Palpatine in his Sidious guise. 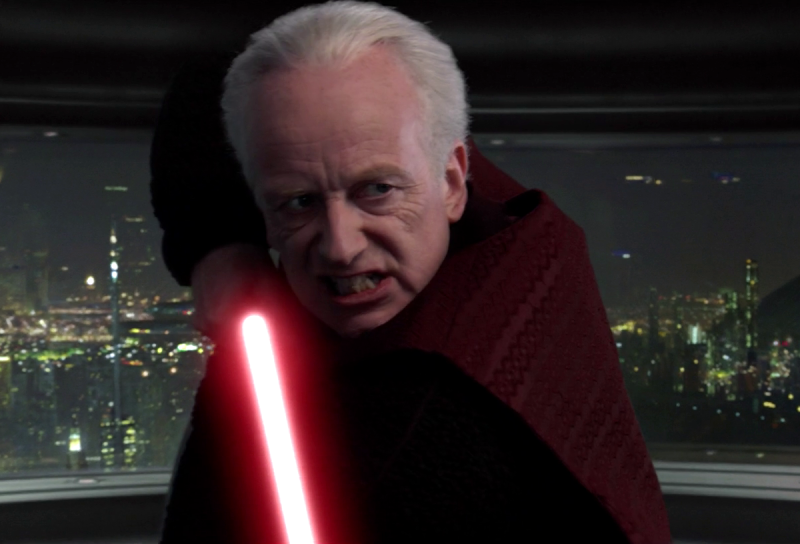 Ian McDiarmid, the actor who portrayed him, had a great turn as the dark lord. Who wouldn’t miss that unnervingly calm demeanor, or that hideously, spine-tingling cackle? Granted, Vader, or rather Anakin Skywalker was the main villain during the time of the Empire. He was the one everyone saw and could relate to. However, Darth Vader was subservient to Sidious. Vader did whatever Sidious wanted and by any means necessary. Vader was Darth Sidious’ enforcer. Darth Sidious manipulated or vexed the Jedi for nearly forty years, spanning both the old and the new Jedi orders. Granted, of the New Jedi Order only Luke Skywalker was a member at that point, but by Episode VII the order has most likely grown in numbers. It would be fun to see Sidious continue this torment and to see how the new Jedi Order deals with it. Another reason he should appear in the new series is he always has a backup plan or, at least can improvise really well. Upon learning about Anakin Skywalker, Sidious made it a point to speak with him on Naboo at the end of Episode I. He said he would keep an eye on him, sensing the great well of potential in the force Anakin contained. Upon meeting him, Sidious knew he had met his future apprentice and at such a young age, his mind was open to all points of view. This was the reason Sidious had such a close relationship with Anakin. At the same time, Palpatine was working on converting Dooku to serve as an interim apprentice. 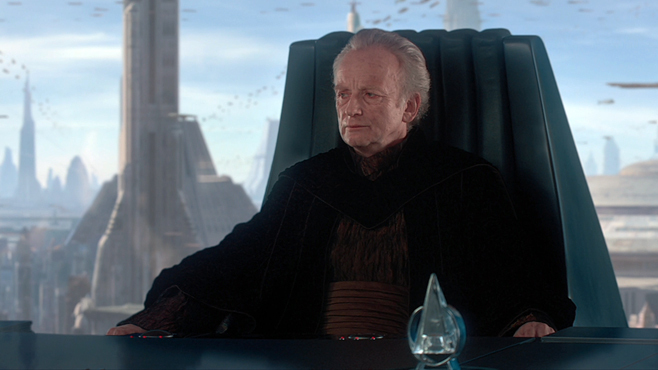 There are several possible ways Palpatine could return to the Galaxy far, far away. He could be cloned. He could manifest as a spirit, or he could be seen as a hologram. The most logical way Sidious could return is in the form of a hologram, like a recorded message with instructions on what to do if he should perish. It would be like a high-tech form of a last will and testament. This could contain a dark secret, for example, directions to a hidden planet. It would be akin to a sinister treasure hunt where the rebels would stumble across danger around every turn. The dark secret could be Sidious’ ultimate weapon of last resort, or maybe his secret bunker where he has hidden some valuable treasure of Jedi origin, or all the secrets he has discovered about the Force; both the light side and the dark. Another scenario would have the hologram be inside a Sith Holocron. A holocron is an interactive device containing lots of stored data; basically a mobile library. One kind is usually in the form of a person; usually the one who made the entry. That person acts as a teacher or guide through the stores of data. Kylo Ren, one of the villains of the new movie, could have such a device and be learning the ways of the Sith through it. He has a red lightsaber and is dressed in black. His mask resembles another Sith from ancient times; that of Darth Revan, seen in the Knights of the Old Republic video games. By those clues, one can assume he is a Sith Lord, or at least a Sith Acolyte, like Asajj Ventress. Ventress, by the way, was Darth Tyrannus’ (Dooku), unofficial apprentice. Her story is one of many told in the excellent Star Wars: The Clone Wars series. From what little is known of the movie, it does not appear Kylo Ren has a master. From what is seen in the trailers it seems he is learning on his own. This is where Darth Sidious comes in. Darth Sidious could have created a Holocron or possessed one from ancient times and added his knowledge to it. Kylo Ren comes into possession of it and thus, in a way Darth Sidious lives on in spirit as his quasi-master. Speaking of spirits, another way Darth Sidious could haunt the Jedi and the heroes of this new era is by literally being a Sith Spirit. The Sith use the same force as the Jedi. Light side, Dark side; Yin Yang it is the same. The Sith have lightsabers. Theirs just happen to be red, which are rumored to be more powerful, but that has yet to be confirmed. The Sith access the force for use in combat the same way a Jedi uses it; to enhance their strength, reflexes, and their senses. They use the force to tap into other abilities like telekinesis and clairvoyance. They meditate on the future using the force to see the events yet to come; obviously, to affect different outcomes. We have seen the Jedi manifest into force ghosts after they die, well some of them anyway. According to Jedi vs. Sith: The Essential Guide to the Force, on page 85, “Being a Jedi does not seem to guarantee one’s ability to rematerialize, and it is only assumed that the transition cannot be achieved accidentally, but rather by some deliberate effort or knowledge.” This idea is reinforced in the episode entitled “Voices” in the sixth season of the series The Clone Wars. Yoda hears the voice of Qui-gon Jinn talking to him. While the other Jedi begin to think the stresses of the war and old age are finally catching up to the diminutive master. He insists Master Jinn is alive. He inquires as to why he cannot see the dead master. No, it was not because Yoda was blind, or Qui-gon was playing a joke on the old guy. Qui-gon replies gently, his training was incomplete. So it does take some training to accomplish this feat. Since the Jedi and Sith have much in common, wouldn’t the Sith need some training to become Sith Spirits? According to the book, Jedi vs. Sith: The Essential Guide to the Force, it states on page 87, “The ability to transcend death is not exclusive to Jedi…” This book is a chronicle of events about the Jedi and Sith and the way the Force is used by the two parties. It pulls information from all the mediums including comics, novels, video games and, of course,the movies. It does explain some concepts with some depth that deal specifically with the Force and the relationship between the factions. Granted, the book was published before Disney bought Lucasfilm and much of that history is unreliable now. When Disney acquired the Star Wars universe, they culled the property, specifically the stories outside of the movies consisting of novels, comics, etc. That large world created over the many decades was known as the Expanded Universe and has been all but obliterated by Disney. If one were to allow it, according to the EU, the Sith have had spirits for a much longer time than the Jedi. The first Sith Lord to manifest as a spirit was Marka Ragnos. Freedon Nadd was another Sith ghost who ruled a planet by possessing each successor to the throne for over 300 years. Then there is Exar Kun who haunted the halls of the Massassi temple on Yavin 4, which was the same location of the rebel base seen at the end of Episode IV. He is awakened later on to convert one of Luke’s students to the dark side of the force as detailed in the series Star Wars: The Jedi Academy Trilogy by Kevin J. Anderson. However, given the above postulates, could not the spirits still exist? And who better to pull it off than the most powerful of the Sith Lords? After all, he has stated in Episode III, “The dark side of the force is a pathway to many abilities some consider unnatural.” Darth Sidious’ former master, Darth Plageuis, was rumored to have found one of the great secrets of the force. He discovered a way to cheat death; to possibly become immortal. 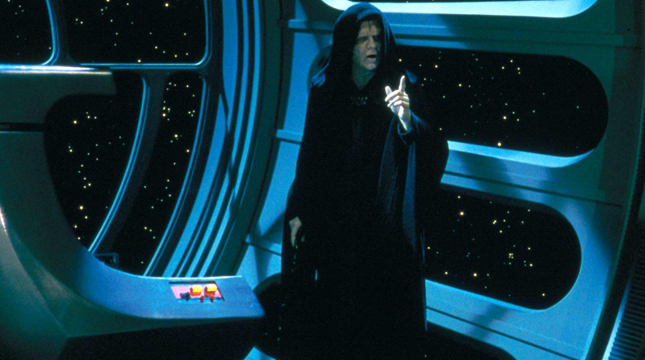 Sidious recites the legend to Anakin in the opera house in Episode III, Revenge of the Sith. “He had such a knowledge of the force, he could even keep the ones he loved from dying.” Sidious, known as Sheve Palpatine tempts Anakin with the possibilities. He concludes the story with the fact that Darth Plageuis taught his student everything he knew and then the student killed him in his sleep. “How ironic, he could keep the ones he loved from dying, but couldn’t prevent his own death.” It can be inferred that Darth Plageuis hadn’t mastered the technique enough to use it on himself and to use this ability one needs at least some knowledge and training. Though, in Episode III, when Anakin is taking his final steps to becoming a Sith Lord, Darth Sidious said, “To cheat death was a power only one has achieved, but if we work together I know we can discover the secret.” This states that maybe he did not learn everything from his master, or maybe it could be he was referring to another character. Only one other character has been known to have physically cheated death. That character was featured in a story arc on the Clone Wars series. In episode 21 of season four entitled, “Brothers,” Savage Oppress searches for and finds his long lost brother. On the planet Lothal Minor amid the piles of junk he finds Darth Maul alive, but not himself. His lower half is now entirely machine, built for him by the Junkers of that planet. It is learned that he survived that would-be fatal strike by concentrating his hatred and rage to one purpose: revenge. The fires of vengeance triggered the Force to help sustain and keep him alive. The Force fed off of his sheer willpower to survive so that one day he could face Kenobi again. It helped him survive those twelve years in isolation, but it drove him mad. With the help of his brother, he emerged from the shadows. Then, in season 5 episode 16 entitled, “The Lawless” he declared himself the true master. He caught the attention of Darth Sidious and according to Sith tradition, all rivals must be dealt with. Sidious defeated Maul, but he did not kill him. Instead, he said to the defeated Maul, “…I’m not going to kill you. I have other uses for you.” Then he sent a storm of force lightning cascading over Maul’s body. One can speculate that he wanted to find out how Maul survived and will literally pry the secret out of him, though not immediately. Sidious is very patient. Research has found it is far easier for the Sith to create a spirit than the Jedi, namely because the Sith cling to the material world. They gather and consume things, like power, wealth, and valuable objects. They don’t want to give up these objects. If a Sith has enough greed and lust to accumulate a certain amount of power in the Force, they might be able to remain in the world after their bodies are destroyed. The Jedi, on the other hand, do not seek wealth or power. They are discouraged from forming strong bonds with other beings, specifically love connections. They are taught to protect life and life is precious, but not to mourn the dead. “Luminous beings we are. Temporary vessels our bodies are. And we shall all find ourselves here in time,” Yoda said in the eulogy he gives in the episode, “The Jedi Who Knew Too Much.” He continues with the statement, “Live through the living we must…” They are raised in the light of the force and almost look forward to the day when they can join with and become part of the force. With this in mind, it would make sense that Darth Sidious could return in the form of a spirit to vex the Jedi. When Darth Vader threw Sidious down the shaft in Episode VI: Return of the Jedi, a strange blue wave of energy shot up. The obvious observation is that it was radiation from the reactor being redirected when the Emperor collided with the reactor. Another explanation is that was the amount of Force energy contained within his body. One could speculate this wave of energy could be the release of Sidious’ enraged spirit. That spirit might be able to travel the galaxy and find a being strong enough and worthy to instruct in the ways of the Sith. The Republic used clones to assemble a very effective army. Darth Sidious, working through his apprentice, Darth Tyrannus, had indirectly worked with the Kaminoans to create this Grand Army. After the fall of the Republic, he probably contracted a clone of himself from them. With the power and finances of the Republic, he might have purchased a couple dozen clones and kept them on ice. Then again, he might have used that Grand Army to invade Kamino, acquire that technology exclusively for himself and either enslave the Kaminoans, or wipe them out of existence. Such was his modus operandi when it came to alien species. Since he was constantly making plans and looking into the future, he could have sensed something was different about the upcoming battle at Endor. Being a cautious man, he could have easily dispatched his clone to go in his place. When news traveled that the Emperor and Darth Vader had perished, he could have gone into exile until he found a new apprentice. A young apprentice that would be able to carry out the tasks given him by Darth Sidious, since by this time his body would have wilted into a very weathered old man. As a Sith grows stronger in the dark side of the force, they amass great power, as such the dark side in turn consumes the physical body. The Emperor said to Luke Skywalker in the mini-series, Star Wars: Dark Empire, volume 2, “…Flesh does not easily support this great power.” Also, he told Luke, “It was not the first time I died…nor will it be the last! Such are the mysteries of the Dark Side of the Force.” Thirty years after the Galactic Civil War, his body would probably be so aged and shriveled, he would be nearly dead. He would need an apprentice to carry out his orders. The apprentice he finds is Kylo Ren. Kylo Ren would become an extension of Darth Sidious, essentially Sidious in all but physical form. In fact, Sidious might be grooming Ren to serve as a host. The time will come when his own body would eventually wear out and he would need to use another ability of the Dark Side of the Force: essence transfer. Sidious would, with the help of the force, move his soul into Ren’s body and take over that form. Darth Sidious is quoted, “My body has decayed again and again…and each time I have needed to take another…” (Dark Empire, #2). He would basically be imitating Freedon Nadd’s legacy. Or, going back to the clones, he could transfer his soul into a clone or many clones over the years. This idea was visited in the story Star Wars: Dark Empire in which it is discovered that indeed Darth Sidious is alive using this very aspect of the force. By doing that, he would have accomplished, to a certain extent, his goal to cheat death and live beyond his natural life. Also, he would be able to hold onto the vast amount of power he has acquired and have the opportunity to gain even more. Though he may not be in this current movie, Lucasfilm may be holding this character back for the big reveal either late in Episode VIII, or in Episode IX. If that happens, Darth Sidious, would be a welcome sight to long-time fans. He may not be as much of a threat physically, but he would be just as effective as before he “died.” Sidious was the puppet master. He was the one controlling everything with his manipulations and schemes. He was the phantom menace haunting the Republic and more specifically the Jedi. Whichever way the powers at Lucasfilm decide to bring him back, if they even do, it would be neat to see Darth Sidious vex the next generation of Jedi. After all, he is a powerful Sith Lord and he was usually behind every dark or evil act in that Galaxy in some shape or form during that time. Be sure to read Erich’s book Is Love Ever-lasting? available in digital download through Smashwords and Amazon. It will also soon be available at other digital book stores, including Apple iBookstore, Barnes & Noble Nook, and Kobo. Erich is the author of the thriller, Is Love Everlasting? He has a BA in Communications from Colorado State University. He lives in Arvada, Colorado with his cat, who always tries to help him with his writing. He enjoys watching movies, writing poetry, or reading a great book. Follow Erich on Facebook at http://www.facebook.com/erichswritingspot.